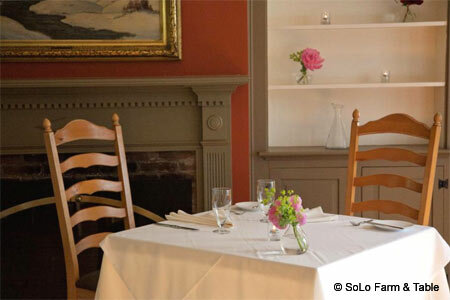 The road less traveled rewards diners with impeccable hospitality and dishes created with locally sourced products. : Owner Chloe Genovart welcomes guests to her classic farmhouse as though they were kin --- an easy charm she famously brought to Thomas Keller's Per Se. SoLo's open hearth fire faces the foyer bar, ideal for warming oneself while cracking into a Vermont-brewed Long Trail Ale. And while local pours abound, few brews beat the rhubarb mint julep: a light, tangy spirit with bourbon, mint, rhubarb jam and lemon juice. In the main dining room, guests find a cheerful, intimate space with bright wood floors and tall, white-trimmed windows. Chef Wesley Genovart (who once captained Manhattan's Degustation) brings Franco-Spanish flair to starters like braised octopus paired with spring vegetables and poached potatoes. Whether it's a rustic confit rabbit leg or country salad, his focus is unmistakable. We paired a Bodegas Eidosela Albariño with pan-roasted Cape Cod Bay monkfish over crunchy fiddlehead ferns and fresh garbanzo beans. Diners will celebrate SoLo's wood-grilled chicken, but with an auteur like Genovart under the toque, poultry might feel prosaic. Instead, trust the explorations of a kitchen that sources much of its food locally, from Manchester rabbit to Londonderry cheese to Weston lamb. Finish with espresso and brûléed bread pudding before retiring to one of the area’s elegant mountain inns.